This past Thursday was some beautiful weather and I was able to leave early from work to catch a round at the Air Zoo. I had the opportunity to play and talk with Bill. 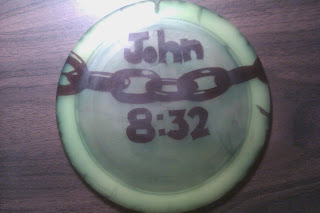 The disc turned out alright as my freehand leaves much to be desired. Next time I am going to just bust out the sharpie. In the meantime, now I will have another tool in the bag for conversations.